We've seen plenty of zombified fruits from Trader Joe's before: apples, bananas, baby bananas, and even other oranges. For the most part, I think those dried fruit snacks have been successful. They're sweet enough to be desserty, but natural enough not to wreck most diets. In all those previous cases, they seemed to capture the innate essence of the fruit and candy-ify it—in some cases without even adding any sugar. Not only is there plenty of sugar here, but these don't really taste like oranges. I mean, I know they're made of orange slices. And they're definitely citrusy. But I think what throws me off is that they left the rind on. And I've mentioned before that I'm not huge into eating orange peels. I don't know many people who are. Once opened, the package gives off a bizarre fermented fragrance—not unlike what I'd imagine marmalade left in the sun might smell like after a day or so. The taste is a little more pleasant than the aroma in my opinion, but again, the bitterness of the rind spoils a good bit of the sweet flavor of the fruit itself. The slices are sticky with sugar, somewhat difficult to chew, and bits of the candied fruit cling tenaciously to your teeth once you've begun masticating. Orange is the new blecch! Sonia was even more repulsed than I was. She literally exclaimed, "Oh God! That's awful!" upon first bite. I think this is her first time giving ZERO stars to a product. I'll give them a generous one and a half, mostly for their decorative value. This might be a return here. Or we might throw a cocktail party and put them to use as garnish, as mentioned above. If the drinks are strong enough, some of our guests might even get crazy enough to eat them. Bottom line: 1.5 out of 10. *That's not actually written on the packaging. 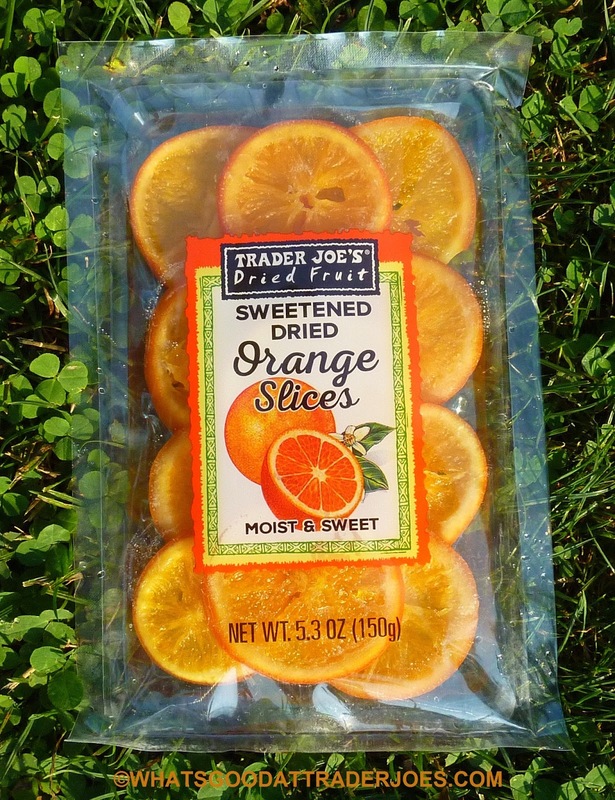 140 calories and 31g sugar for 3 orange slices!! Orange slices jelly candy has less calories and grams sugar for the same serving sice. I don't even need to taste it to give it 0 stars. Yup. 31 of the 40 grams is sugar! I spotted these early thois week, decided not to give them a try as I don't eat as much dried fruit as I think I do (based on a few half-eaten packages in the pantry.) Looking at the nutrition info (which I didn't do) would've made it a definite no-buy. You could do it at home! Just buy some chocolate and dip these. That's an interesting idea. As much as I disliked them, I would totally try dropping them in orange juice for a while just to taste the result. I really like these a lot, although the rind was inedible. I threw one in a cup of coffee, and shockingly it was really good. I'm head over heels in love with these things. I've always loved candied orange, and so these are right up my alley -- sweet, rich, with that bittersweet rind. I'm stocking up in case they're too 'weird' for TJ shoppers and discontinued soon. I find it really mysterious that the vast majority of facebook comments agreed with our assessment of this product and yet these vague, barely-used blogger and livejournal accounts disagree here on the blog. Oh well, more for you guys, I guess. 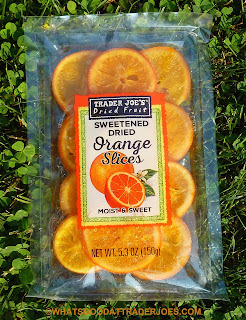 When you Google "sweetened dried orange slices," this blog comes up as one of the first hits. Swear I'm not a shill. :-) I really like them, but I tend to like really strong flavors. I just googled these because I just discovered and wanted to see what people were using them for and what they had to say. I am so shocked - lol. I LOVE these - I don't eat cookies or other sweets so this is a great little snack (2 or 3 a day). I also chopped up a couple and put in glass with vodka and mango polar seltzer for a yummy cocktail! I LOVE these too - I mean if you love marmalade, how can you dislike these? And yes, rind and all. I love these! It's so hard to eat just one. They are incredible. I love the texture and the flavor of the rind, too—chewy, with plenty of bite.